These are listed with no chronological or other importance. 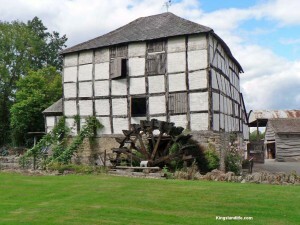 Farming – vital to the area and including cider making, bee-keeping, hops, etc.. The making of mead from honey, ale from barley, and cider from apples must have been practiced in Kingsland since time immemorial. Milling: with the three rivers in the area (Lugg, Arrow and Pinsley), Kingsland was always well-off for mills. 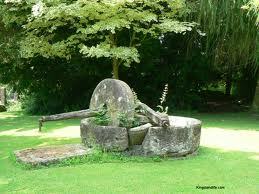 There were/are water Mills at Arrow Mill (OS 436 587), Kingsland Mill on the Lugg (OS 448 6220), Mortimers Cross, Day House Mill (OS 446 623), Waterloo Mill (OS 452 605). The Bone Mill (now a private house renamed Kingsfield) (OS 435 623) was used to grind bones to make phosphatic fertiliser for the fields. There was also a Fulling Mill. Glove Making – so important an industry in Leominster early in the 19th Century – was also practiced in Kingsland. The Must Mill was at one time also a glove “factory”. Wagon Making: as late as 1925, G. Lewis & Son were making the “Convertible Jubilee Wagon” and the Herefordshire “Prize Medal” carts at the premises now renamed The Garth opposite the school. They were established for over 50 years and employed blacksmiths, carpenters and wheelwrights. See photographs in the Photo Gallery on this web. Saw Mills: Kingsland Saw Mills adjoined the station. The hand saws and steam driven saws have now been replaced by electric ones. In about 1921 the only aerial railway in the country was erected for carrying pit-props from Lyepole to Kingsland (some 3.5 miles). It was locally called “The Cradle Railway” as the pit props were stacked in the “cradles” which swung along an endless cable. Shoe Making: a shoemaker made and repaired shoes for miles around. Incidentally this man was also the village constable, and his truncheon and handcuffs were always proudly hanging on the wall in his cottage. Cabinet Making: furniture for the village was also locally made, producing finished articles that are household treasures today in many parts of the county. Often, one comes across his furniture – often made in elm – with a lovely grain when finished and polished. Coopering: there was a cooper who made little cider bottles (called Kostrells) from oak and, with ordinary care, were practically everlasting. Sadler: the local sadler did repair work for all the farms in the district and often got orders for sets of harness. He also varied his work by making footballs and at one time was the postman. See the Photo Gallery for a view of the postman, Mr. Sankey, who used to blow his horn to give notice that he was in the area. 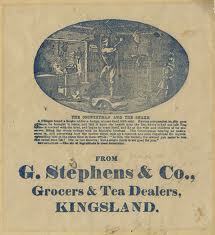 G. Stephens & Co. were Grocers and Tea Dealers at the Bell, Kingsland (see leaflet on right which was found in the Bell’s attic). The Angel: close to the Church and next door to Angel House which was probably the original hostelry. The Corners: dating from the 16th Century and considerably altered and extended since. The Bell Inn (called the Blue Bell in 1886) opposite Croase House in the centre of the village. Miss Stephens was also draper and grocer and advertised good accommodation for commercial travellers. The Red Lion (in 1856 a Mrs Crump was the landlady). See Village Talk for more information from her descendant in Australia! The Monument, previously called The Horseshoes (1900), and the Mortimer’s Cross (1801). The Dog, the name of which survives in Dog lane between Lawton and Cobnash. The Crown – at Shirlheath in 1858. Today, there are only two public houses (the Corners Inn and The Angel). Transportion: in more recent times, W. Bengry and Sons moved from a one man business to one employing some 50 men and doing work of National importance. In 1939 their vehicles were requisitioned by the War Department and continued to develop until they were nationalised in 1949 !! The Bengry family continues locally with other businesses. 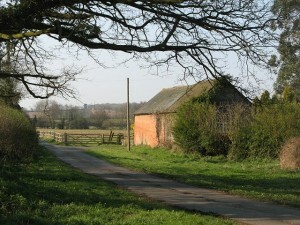 In addition, there was a smithy at Cobnash – and others elsewhere, a tailor who made all the clothing for the scholarship boys from the village who went to Lucton School, three or four thatchers, a basket maker (John Hornsby), and a fishing tackle expert (Richard Williams) who used to make trout and grayling flies. Also, Spade-Tree Makers, Lathcleavers, Clogg Makers, and other businesses have flourished in the Parish over the years.